For the new year: Persecution, Hatred, Anarchy, Betrayal, Racism, and more falling away! Are we ready to endure the next wave of end-of-this-age chaos? 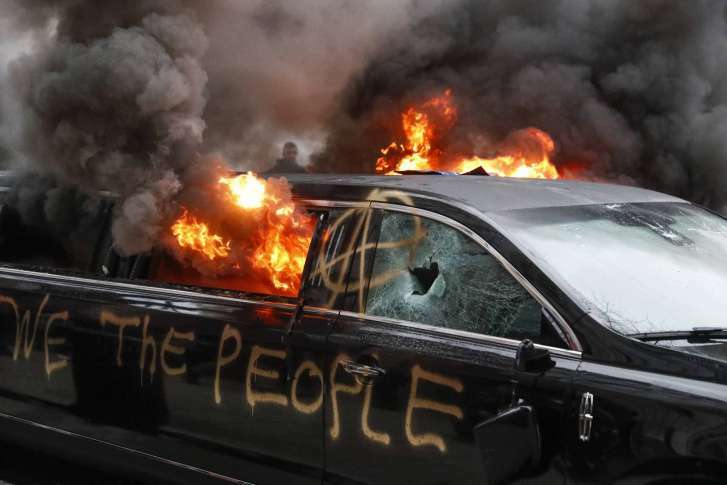 The election of Trump may slow down some of the nightmarish changes leading to the coming new world order, however, the backlash from the disgruntled from this election loss is igniting a powerful wave of lawlessness (anarchy) and hate. Unable to politically oppose new policies, far left money is now being funneled into organized protests, riots, and lawlessness pushing for tantrum politics to enact change and keep the creep of globalism to speed on. Who is really behind all this, it is none-less than the mysterious man of lawlessness. We must be following Christ and obeying Him, and embrace all that he taught—starting now! The rapture will not rescue us from the coming troubles that are reaching a boiling point. The Apostle Paul was explicit, the man of lawless will be revealed before the Lord’s appearance: “Let no one deceive you in any way. For that day will not come, unless the rebellion comes first, and the man of lawlessness is revealed, the son of destruction, who opposes and exalts himself against every so-called god or object of worship, so that he takes his seat in the temple of God, proclaiming himself to be God…. For the mystery of lawlessness is already at work. Only he who now restrains it will do so until he is out of the way. And then the lawless one will be revealed, whom the Lord Jesus will kill with the breath of his mouth and bring to nothing by the appearance of his coming” (2 Thessalonians 2:3-8). Christians are deceived and asleep concerning this hour and the coming gross darkness. Most are spell bound because of their love for this world. They are oblivious to the mysterious patterns of lawlessness that is ever increasing in frequency and intensity. It’s all leading to the satanic inspired rebellion! Like Korah in the wilderness stirring up rebellion to oppose Moses, the mystery of lawlessness will stir up rebellion and anarchy. This is how evil gains political power over the soft-passive minds of the masses, including Christians who live at ease, carelessly prancing through life. Trouble and chaos forces the naïve to follow false leadership, and on the other hand the trouble will awaken many true Christians and millions of lost to embrace the Gospel in its entirety. So, in God’s faithfulness will continue to allow tribulation to increase just as Scripture decrees, to wake up his people, that they might become ready to endure to the end. Unfortunately, the foolish Christian under the many false doctrines and misguided leaders will continue to fall away from God, where their love toward God, Christ and his Gospel will grow icy cold.